Good Style explains the tactics that can be used to write technical material in a coherent, readable style. It discusses in detail the choices of vocabulary, phrasing and sentence structure and each piece of advice is based on evidence of the styles prefered by technical readers and supported by many examples of writing from a variety of technical contexts. John Kirkman draws from his many years of experience lecturing on communication studies in Europe, the USA, the Middle East and Hong Kong, both in academic programmes and in courses for large companies, research centres and government departments. 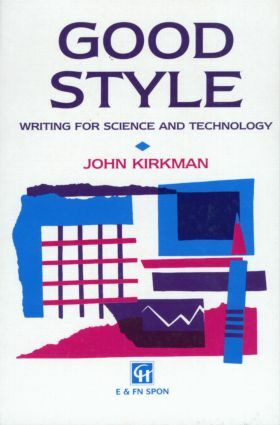 Good Style has become a standard reference book on the shelf of students of science, technology and computing and is an essential aid to all professionals whose work involves writing of reports, papers, guides, manuals or on-screen texts. This new edition also includes information on writing for the web and additional examples of how to express medical and life-science information. Which style do technical readers prefer?